Moscow: ‘Six years ago, Russia did not have the capability to initiate military action in inaccessible territories in any part of the world. However, the Russia army can prepare for war within a matter of one hour,’ Russian Defence Minister Sergei Shoigu announced. ‘The readiness and the confidence of the Russian military has improved because of the Syrian conflict. Also, Russia was able to test new weapon technologies, during the Syrian conflict’, the Russian Defence Minister also informed. 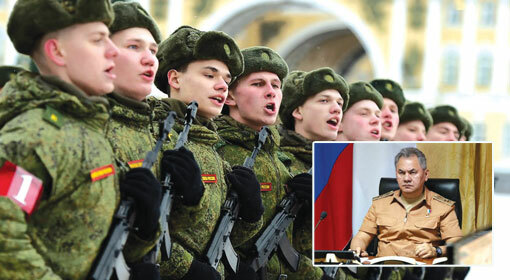 While addressing the lower house of the Russian parliament, Defence Minister Shoigu said that the Russian military was ready to face any challenge, anywhere. ‘In 2010, the Russian military was not equipped to handle big campaigns in inaccessible areas of the world. Moreover, the Russian military was not willing to undertake such campaigns. Nevertheless, in the last six years, the scenario has changed, and there has been a mass improvement in the readiness of the military and the weapons also have been modernised’, Shoigu claimed. ‘The Russian military did not have the professionalism to be ready for a war in one hour. As of today, the Russian military can ready itself for any campaign in a matter of one hour,’ Shoigu said. The Russian Defence Minister informed that ‘three years ago, the Russian military started its participation in the counter-terrorism action in Syria. Taking advantage of the counter-terrorism action in Syria, Russia tested 316 new advanced weapons systems’. The Russian Defence Minister clarified that the Russian defence forces were equipped with 109 Intercontinental Ballistic Missiles, in the last six years, while working on war preparedness. At the same time, Russia tested 108 submarine-launched missiles. Apart from this, in the previous six years, more than 4,000 tanks and military vehicles also more than 1,000 fighter jets and helicopters, and 161 destroyers have been added to the Russian military, the Russian Defence Minister clarified. Shoigu repeatedly emphasised that the Syrian conflict was a major contributing factor to the Russian military’s war preparedness. At the same time, Shoigu pointed out that the confidence between the Russian people and the military has increased since 2012. It was found in surveys that the negativity in the Russian military had decreased by 80% and the confidence of the Russian people in the military had increased, in the last two or three years. Shoigu declared that riding on the stated confidence and the war preparedness, the Russian army can successfully undertake any military campaign.